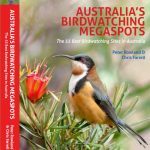 The book gives in depth information on Australia’s 55 Birdwatching Megaspots, the 55 sites that typically rank highest in each state or territory for species richness or are home to the more uncommon species. 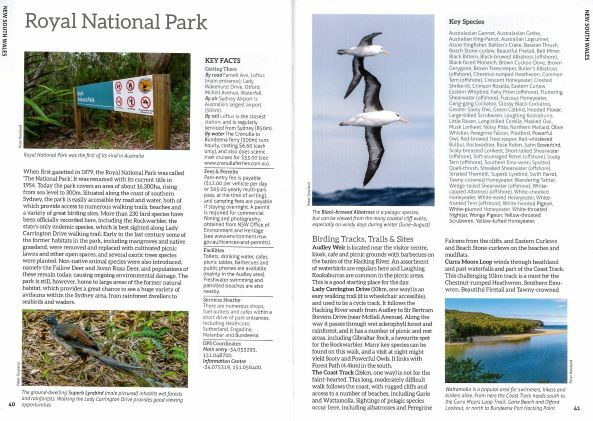 Summaries of a further 40 sites have also been included to provide the reader with the opportunity to visit additional sites as they travel and see Australian bird species that do not typically occur elsewhere. 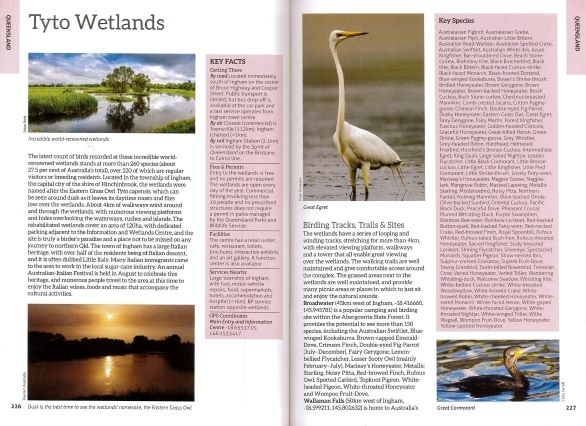 The book includes 120 individual bird species accounts, over 500 colour images and detailed site specific information, including birding tracks and trails, GPS coordinates, access details and directions, facilities, contact information, transport information, other nearby sites of interest and detailed accommodation options in each area. 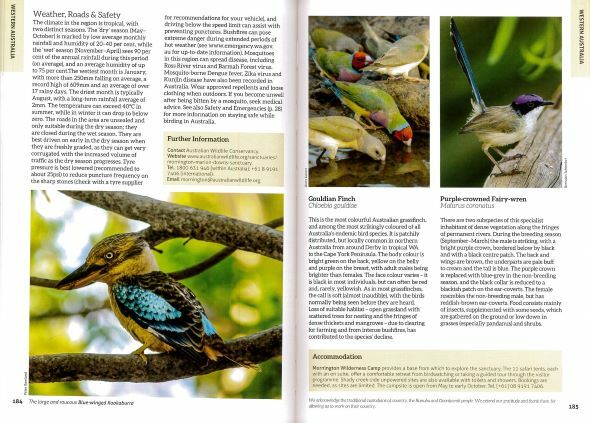 There are also ethical birding guidelines, an overview of Australia’s modern bird families, safety and emergency guidelines and a handy checklist of all bird species and subspecies recorded to date in Australia for the reader to record their sightings as they travel. 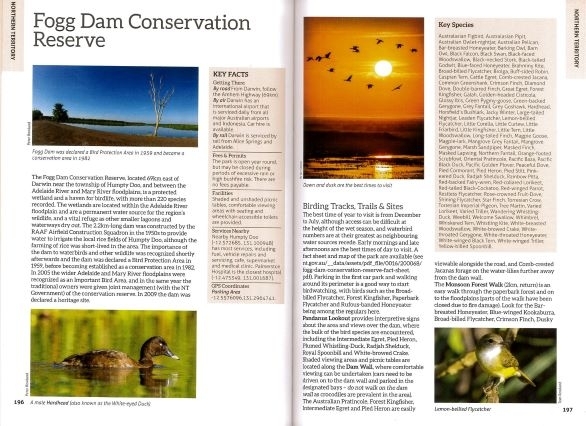 All designed to provide visitors with the essential information they need to plan a successful birding trip. There are ten sites on mainland New South Wales, four in the Australian Capital Territory, six in Victoria (including Phillip Island), four in Tasmania, five in South Australia (including Kangaroo Island), seven in Western Australia, five in the Northern Territory, nine in Queensland and five remote offshore islands. There are also details of nine (current at the time of writing) pelagic trips run by individuals and organisations around Australia. 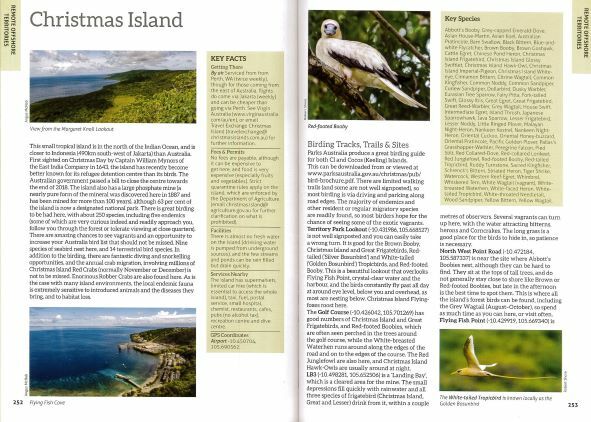 Our group, Australia’s Wildlife, is dedicated to the conservation of our natural world, including our wonderful and unique birdlife, and the promotion of Australia as an ecotourism destination. 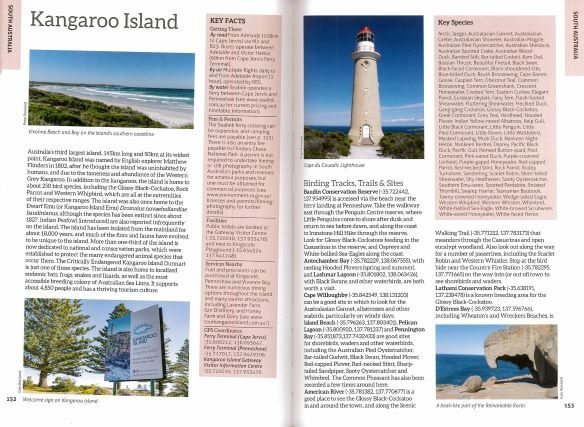 We feel that this book will help attract international visitors to our country and encourage domestic travel, providing valuable revenue to our economy (especially in regional Australia), which can be used to support conservation efforts at both local and national levels. 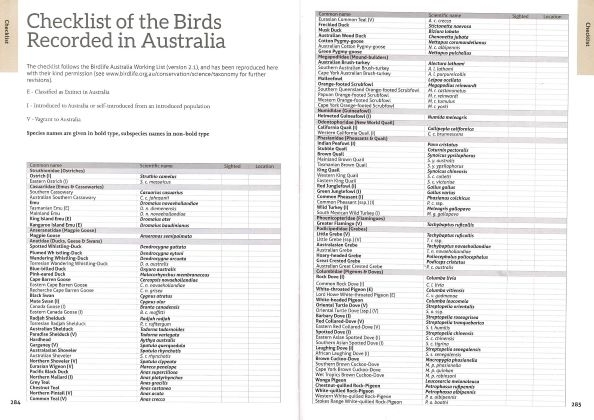 Chris and Peter are extremely grateful to all of the people who contributed their images, text and/or time to the project and are also very thankful to Birdlife Australia and WWF Australia for their endorsements of the book. 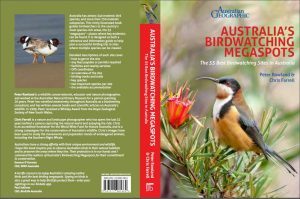 A special thank you goes to Aniket Sardana, who founded the Australia’s Wildlife Group with Peter Rowland in 2014 and without whom this book would not have been realised. 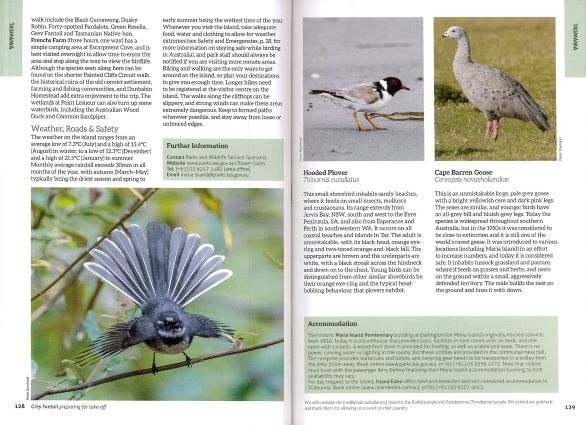 On our recent trip to the Britain Birdfair at Oakham, UK, Peter and Aniket were delighted to show the book off to some of the wonderful people who work so hard to promote the areas and accommodation/tour companies that are featured in the book. Some of the people they met up with included Fleur and Steve from TourismNT, Luke from NT Bird Specialists, Linda from Christmas Island Tourism, Cat from Inala Nature Tours, Susie from Tasmanian Odyssey, Sue and Phil from Cassowary House (and Sicklebil Safaris) and Steve from Bellbird Tours. 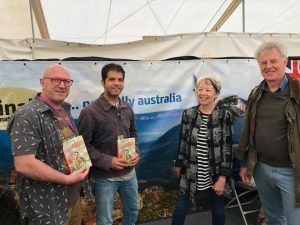 Aniket and Peter also caught up with Rosemary and John from John Beaufoy Publishing, the people who turned the words and pictures into a physical book! 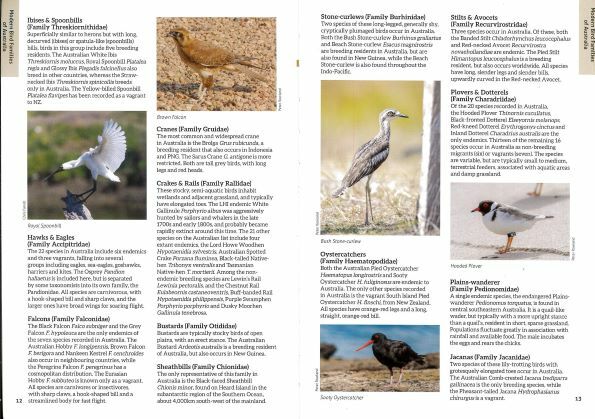 Copies can be purchased through most major retailers or directly from Australia’s Wildlife Group (Birdlife Australia members receive a 10% discount if they buy from us). More information here. Thank you so much for the message. Yes there are a few sites around the region. 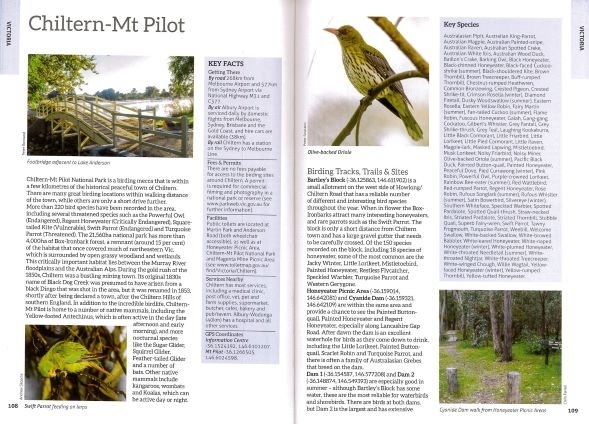 Within the main part of the book the closest site to Shoalhaven Heads is Barren Grounds Bird Observatory, with nearby areas Minnamurra Rainforest, Wollongong Botanic Gardens, Comerong Island and Booderoo National Park being mentioned as nearby sites for visitors to call into while in the area. Lake Wollumboola further south is included in the ‘Other Must See Places’ section of the book. 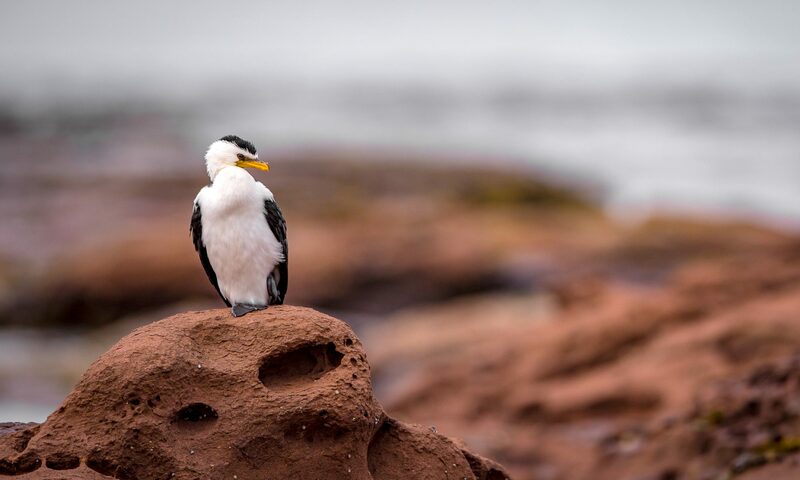 I often visit Shoalhaven Heads, as it is just 30 minutes south of where I live, and love birding along the beach and through the coastal woodlands. 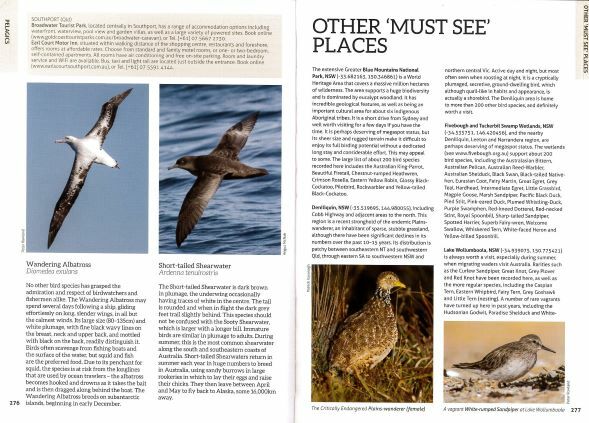 I often see Yellow-tailed Black-Cockatoos, Far Eastern Curlews, American Golden Plovers and Dollarbirds there at this time of year, so I may well be calling in again soon! I can’t wait to get my hands on a copy Peter. Is there anything in there about the south coast of NSW, specifically around Shoalhaven Heads and either shorebirds or migratory birds in this area? This is a terrific, easy to navigate book that made me want to start planning my next holiday around the recommended sites. I love the checklist at the back, for it makes it easy to engage the kids. 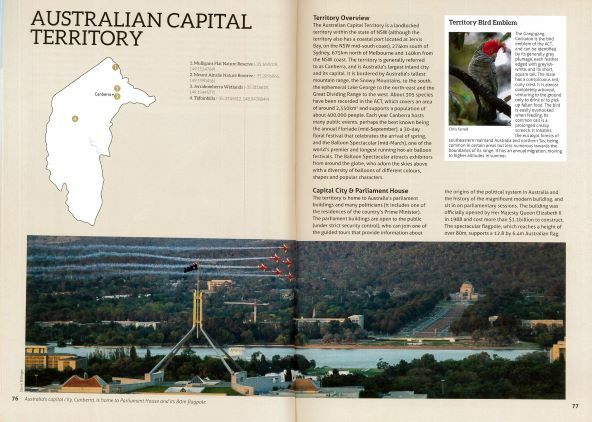 Australia is home to some wildlife gems, and this book is now one of them. Congratulations and thanks to the authors.